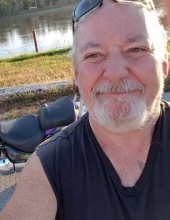 Rodney “Rod” Lee Binau, age 58, passed away unexpectedly on March 14, 2019 at home. Rod was born August 16, 1960 in Shenandoah, Iowa to Thomas and Dorothy Binau, and was one of 4 children. Rod made a life for himself as a Pressman in Council Bluffs and Sioux City. Rod was a natural mechanic and handyman. When he wasn’t tinkering around, you could find him riding his bright purple motorcycle around town. He is preceded in death by his father, Thomas Binau, special friend, Peggy Jennings, and goddaughter, Jasmine Camarena. Rod is survived by his mother, Dorothy (Howrey) Binau of Council Bluffs; daughters, Angela (Robert) Dobyns of Council Bluffs, Jennifer Binau (Aleks Ozolins) of Charlotte, North Carolina, Denyell Binau (Blake Strong) of Council Bluffs, and Daisya Horn of Sioux City, Iowa; grandchildren, Gabriella “Ellie” and Charlotte “Charlie” Dobyns, Aubriella “Aubrey” and Liam Strong; siblings, Larry (Leslie) Binau, Barbara (George) Holmes, Tommy (Tammy) Binau, all of Council Bluffs; nieces, nephews and a host of other family and friends. To send flowers or a remembrance gift to the family of Rodney L. Binau, please visit our Tribute Store. Celebration of Life will be at 4:00 p.m. Fellowship with the Family will follow from 5:00 to 7:00 p.m. Private Interment will follow at a later date. "Email Address" would like to share the life celebration of Rodney L. Binau. Click on the "link" to go to share a favorite memory or leave a condolence message for the family.